These ads are listed chronologically with the oldest ads listed first. Full color 13" x 9 1/2" ad for the Year-Round Soft Drink. The ad has a picture of a smiling man wielding a big metal shovel as he shovels snow into a shoulder height pile. The headline reminds us that "Thirst knows no season" and the text tells us that "It's always summer to your thirst". There is a smaller picture of a man's hand gripping a bottle of Coke as he holds it up. This ad is larger than my scanner bed so the outer edges of the ad will not be visible in the scanned view. 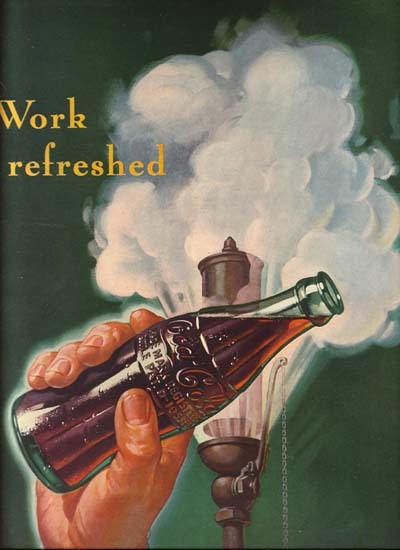 Full color 9 1/2" x 12 1/2" ad shows a large hand holding a full bottle of chilled Coke in front of a steam whistle indicating the end of the day. The only words in the ad is the large headline urging you to "Work Refreshed". This ad is larger than my scanner bed so the outside edges of this ad are not visible in the scanned image. Full color 9" x 12" ad with a patriotic sense to it. 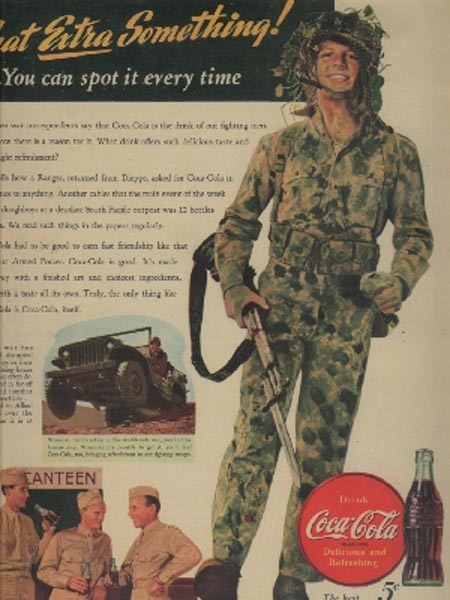 The ad has a drawing of a hot soldier on a march with a pack and rifle over his shoulder. He has stopped to wipe his brow and spots a sign that says Drink Coca-Cola which causes him to exclaim "Howdy, friend". This ad is larger than my scanner bed so the outer edges of the ad will not be visible in the scanned view. Full color 9 1/2" x 13" ad that reminds us that the Taste of Coca-Cola is International. There is a picture of an Allied soldier meeting with some residents of Iceland on a hill overlooking the coast and they are sharing bottles of Coke. The headline says "Have a Coca-Cola = Come, be blessed and be happy...or how to break the ice in Iceland". We get the explanation tht the phrase of greeting in Iceland is "Come, be blessed and be happy" but the form of greeting for Americans is "Have a Coke". Full color 10" x 13" ad shows three ladies brown-bagging it at the office. 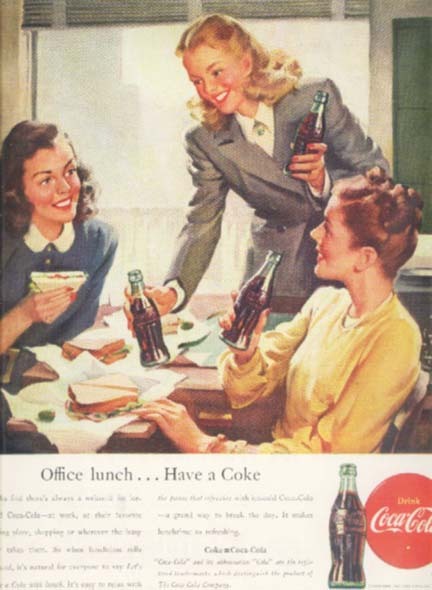 The ad headline has the message "Office lunch...Have a Coke". This ad is larger than my scanner bed so the outer edges of the ad will not be visible in the scanned view. Full color 7 1/2" x 10 1/2" ad that shows three young ladies sitting at a soda fountain. The ad headline reminds us to "Pause to Refresh...at Everybody's Club". This is an ad from a back cover and has a little staining along the right side. This ad is larger than my scanner bed so the outer edges of the ad will not be visible in the scanned view. Three color 8" x 11" ad. The ad is actually for Westinghouse but they are discussing a Coca-Cola cup vending machine they have designed. Full color 9 3/4" x 13 1/2" drawing of a larger than life Santa Claus drinking from a bottle of Coca-Cola with a huge smile on his face. In the foreground are two little children holding the refrigerator door open so they can load bottles of Coke from a cardboard six-pack onto the top shelf. The ad headline says it all "For Santa". This ad is larger than my scanner bed so the outer edges of the ad will not be visible in the scanned view. Full color 7 3/4" x 10 3/4" ad that gives you two very important reasons that you should buy Coke. We see a smiling young lady in a vest and coat pushing a shopping cart filled haphazardly with items with a Six-Pack of Coca-Cola perched high on top. The headline says "For Home and Hospitality" and the text talks about how good it is to be able to offer a bottle to a guest, but how refreshing it is to have one for yourself. There is a caption under an inset that gives a tip to "Keep Coke in the coldest spot in your refrigerator and serve ice-cold...right in the bottle". Full color 10" x 13 1/2" ad that claims that "Baseball and Coke grew up together". There is a picture of a young man sitting on the bench, an assemblege of bats behind him, smiling and drinking a Coke. There is another man standing behind him holding a glove as a red flag is flying behind him. There is a string of flags on the right side of the ad. These flags say the 75th Anniversary for the National League, the 50th Anniversary for the American League, the 50th Anniversary for the Minor Leagues and the 65th Anniversary for Coca-Cola. The text of the ad congratulates all of the people who play this game and they say that they "have come to know that all play calls for a pause - the pause that refreshes with ice-cold Coca-Cola. 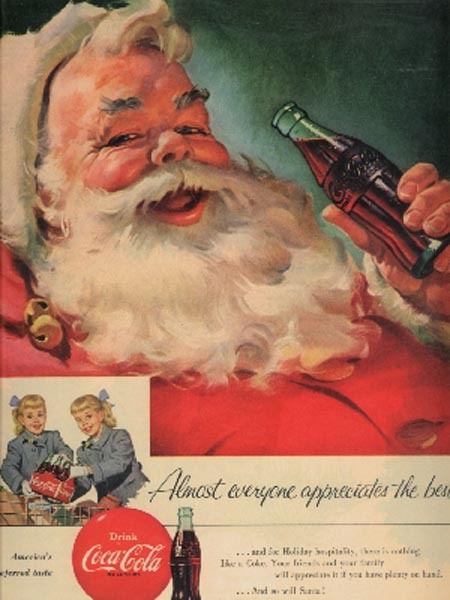 Full color 9 3/4" x 13 3/4" ad has a large, colorful drawing of a jovial Santa sitting at his desk in front of his Good Boys and Girls book with a Coke in one hand and his book of notes in the other. The ad headline says "...talk about being good!". This ad is larger than my scanner bed so the outer edges of the ad will not be visible in the scanned view. Full color 9 1/2" x 13" ad that calls attention to the Popularity of Coke. There is a picture of a group of young people having a barbecue on a sunny day. One attractive young girl is kneeling in the grass and pulling cold bottles of Coke out of the red Coca-Cola ice chest as every person tries to get her attention in the hope of getting one of the remaining bottles. 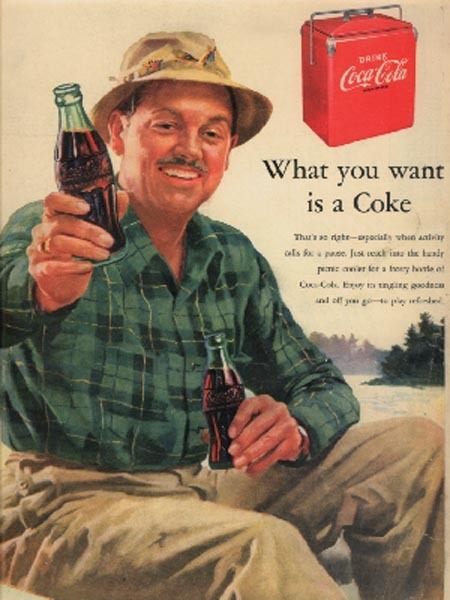 The headline reminds us that "There's nothing like giving folks what they want" and the text explains that "among things expected at a picnic is ice-cold Coca-Cola". It also suggests bringing it in a picnic cooler and buying it by the case. Full color 9 1/2" x 12" ad for the joy of sharing a Coke. The ad has a picture of a man in a gray suit with a vest and a yellow tie standing in front of a large brick building in a Fall setting holding one bottle of Coke tight to his chest as he extends another one toward the reader as the headline says "Refresh yourself". 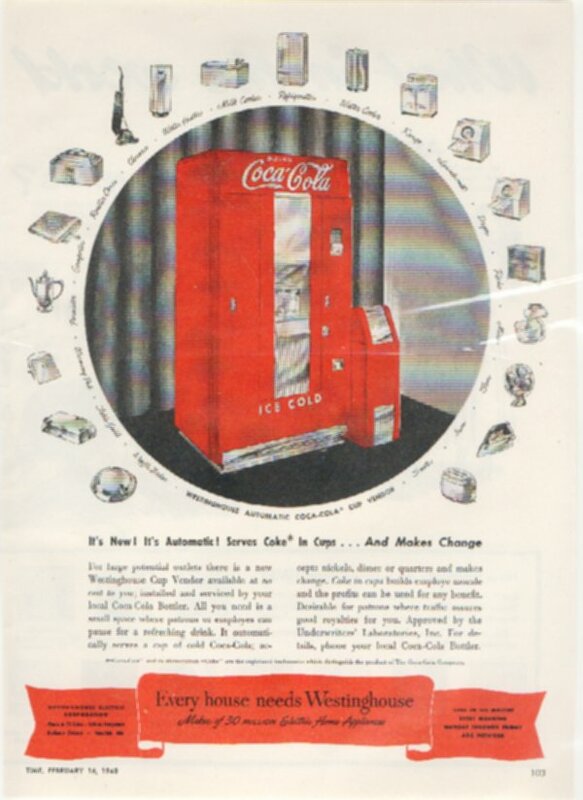 In the bottom left corner is a picture of one of the older red metal Coke dispensers and the text talks about drinking Cokes being a wonderful way to make any kind of get-together better. This ad is larger than my scanner bed so the outer edges of the ad will not be visible in the scanned view. 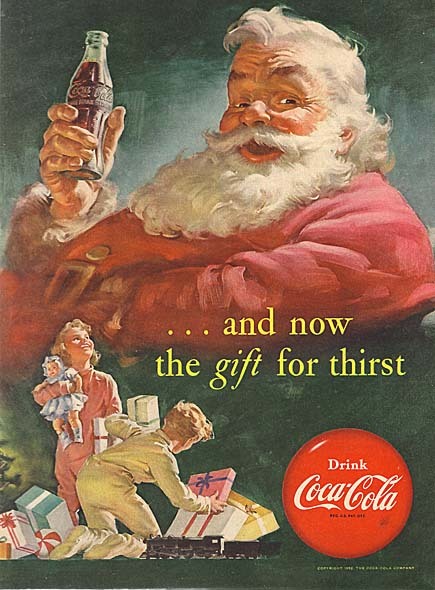 Full color 7" x 10 1/2" ad shows a large Santa smiling as he holds a bottle of Coke while two children are shown underneath him smiling as they seperate and open presents. The ad also has the round "Drink Coca-Cola" emblem. Full color 9 1/2" x 13 1/2" ad that is a larger version of the previous ad. A large, red-cheeked and jolly Santa Claus is holding a bottle of Coke above a drawing of two little children who are opening their gifts with joy. The ad headline says "...and now the gift for thirst". This ad is larger than my scanner bed so the outer edges of the ad will not be visible in the scanned view. 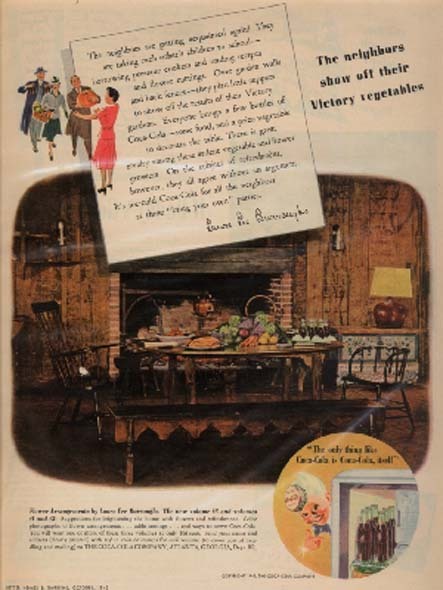 Full color 7 1/2" x 10 1/2" ad that put having a Coke into a picture of a happy-home scene. There is a picture of a family room where the fireplace is roaring with a warm fire. A young mother has come into the room carrying a tray filled with five bottles of cold Coca-Cola and is offering them to her two children who sit before the fire with a bowl of popcorn. 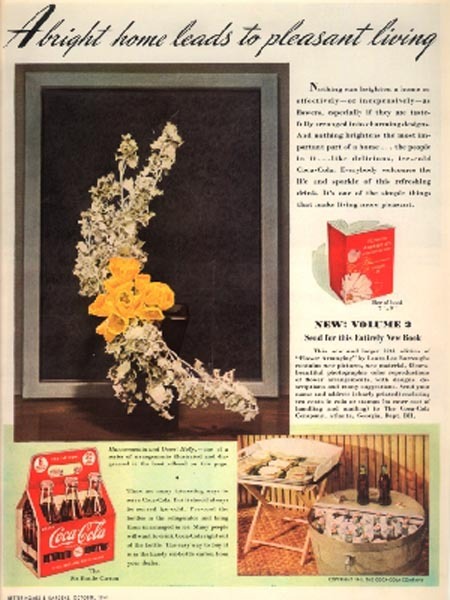 The ad headline tells us that "Home-grown fun has lots of flavor" and, under a small picture that shows a man dragging a wooden case of Coke out from the back end of his pickup truck with a wooden bed, is the reminder to "Take enough home". The text mentions the importance, now and forever, of the family circle and tells us how "Coca-Cola fits so properly into this picture". Full color 7" x 10 3/4" ad for the soft drink that the young folks drink. There is a picture of a get-together on a patio with at least a young man and two young ladies gathered around a record player with full and empty bottles of Coke. The ad headline says "For young America at play...pure, refreshing Coke" and the text claims that the two things that are necessary for a party to click are young people and Coke. Full color 7 1/2" x 10 1/2" ad with a drawing of a young man being shown the "Family Photograph" book by the mother of his girl friend. The girl friend is just walking into the room bringing a platter with three bottles of Coca-Cola and is looking at Mom to catch any hints of approval. Full color 7 3/4" x 10 3/4" ad that reminds us that Coke Time should be a "happy family custom". There is a drawing of a mother who is working on her hobby of painting pictures and her two boys, just in from a game of baseball, have come in with three bottles of Coca-Cola, one for each of them and the one that is being offered to a thankful mother. The text tells us that any family event, big or small, should be enjoyed with frosty bottles of Coke. Full color 6" x 9" ad with a picture of several people are sitting on the floor enjoying Coke while they talk and play records. The ad headline reminds us that "Almost everyone appreciates the best". Full color 9" x 13 1/2" ad that shows a couple and their child dressed for a social function. They are gathered under a red and white umbrella and all three drinking Coke, pouring it from bottles into glasses. The headline says that "Almost everyone appreciates the best" and then shows a bottle of Coca-Cola. The ad text says "A hot sun, a big thirst - and nothing will do but a Coke" and claims that "Fifty million times a day...at home, at work or on the way 'There's nothing like a Coke!'". Full color 10" x 14" ad for the many ways and places that Coke is at it's best. The largest picture shows several young adults, with a male and female staring happily into each others eyes as they have their bottles of Coke interlocked, sitting at a table with a blurred background. The other pictures show a couple raiding the refrigerator for Coke, a man painting a small piece of furniture being handed a Coke and two formally-dressed couples sitting with full and empty bottles of Coke around them. The ad headline says "That Great Taste of Coke It puts you at your sparkling best!". This ad is larger than my scanner bed so the outer edges of the ad will not be visible in the scanned view. 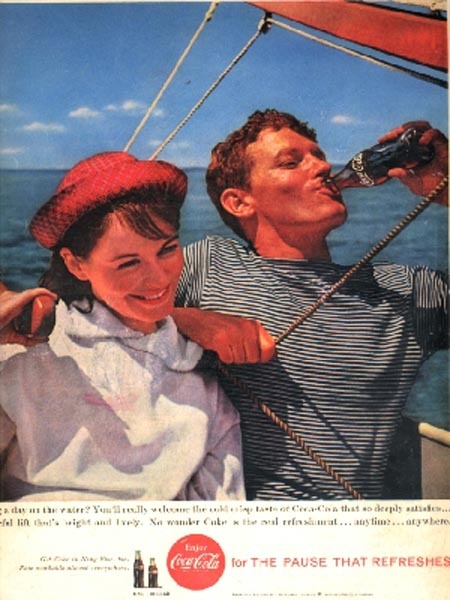 Full color 10" x 13" ad shows a young couple drinking their Cokes. The ad is on a red background with drawn in water droplets on it. This ad is larger than my scanner bed so the outer edges of the ad will not be visible in the scanned view. Full color 6 1/4" x 9 1/2" ad has a softly drawn picture of a couple sitting at a table enjoying Coke while, behind them, a man works at a drawing while others watch. The ad headline says "At Lake Louise, too...'Sign of Good Taste'". Full color 6 1/2" x 9 1/2" ad has a picture by Jack Potter of people enjoying Coke in front of a Maharaja's Palace in India. The ad headline describes the Coca-Cola sign as being known "All over the world...Sign of Good Taste". Full color 9 1/2" x 13 1/2" ad that tells you, whatever kind of party you are having, serving Coke will make it better. This ad has four pictures of a party that is headlined as "Making Happy Music Together". It shows a man playing a banjo, a lady preparing snacks and then serving them and, the last photo shows the group laying on the floor listening to a tape recorder playing back their feeble attempts at music. Full color 7 1/4" x 10 1/2" ad for The Pause that Refreshes. The ad has a picture of a housewife who has stopped her cannister vacuum and plopped down in a living room chair with a glass of Coke and a telephone to take a break during her day of work. The ad headline reminds you to "Be really refreshed...Pause for Coke". Full color 9" x 13" ad that wants you to realize that a picnic can't really be a picnic without Coca-Cola. Two girls have spread a blanket on the beach and are filling it full of food for an army. Sitting at the back of the blanket is a cooler of Coke and about thirty feet farther back are four people anxiously waiting for the word to come and eat. The headline asks everyone to "Be Really Refreshed...with Cold Crisp Coke!" Full color 9 1/2" x 13 1/2" ad that asks you to "Be Really Refreshed...Pause for Coke". The picture shows a couple who are working on their beautiful garden. The man is intently peering at a bloom and his wife, while his attention is diverted, is taking a big swig from a cold bottle of Coca-Cola. The text refers to drinking a Coke as experiencing "Refreshment in Bloom". Full color 9 1/2" x 12 1/2" ad for the soft drink that always refreshes. The ad has a picture of a young lady in a white prom dress standing shyly in front of a pink curtain with her eyes tightly closed in indecision. Reaching into the picture are four male arms covered in the sleeves of dark tuxedoes each offering her a bottle of ice-cold Coke. Each bottle is uncapped and has a straw protruding from the tops as the boys hope that the favorite drink will impress this pretty girl. The ad headline encourages you to "Be really refreshed!" with the drink that "refreshes you best". Full color 9 1/2" x 12 1/2" ad for the soft drink that is best to Celebrate with. The ad has a picture of a young couple who, still wearing their graduation gowns, are running down the cement steps in excitement as they hold their diplomas and a bottle of Coke in the other. The ad headline says "What a Refreshing New Feeling...what a special zing...you get from Coke". The ad mentions it being available in Regular or King Size and has a picture that shows the difference in the bottles. Full color 10" x 13" ad that presents Coke to us in an unusual way. There is a drawing of a body of water with a small, two-foot wide piece of ice floating in it. On this piece of ice sits a bottle of Coke, filled, a glass filled with Coke and a paper cup that says "Have a Coke" and it is filled with Coke. 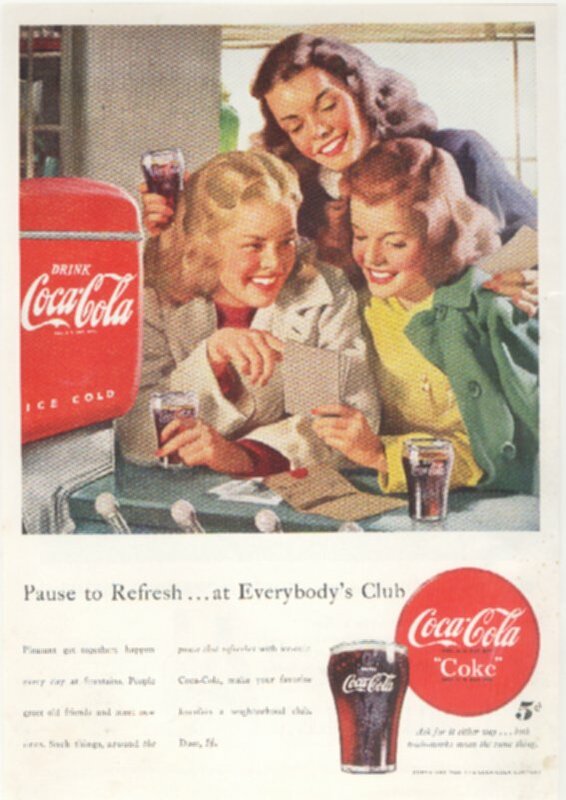 The text of the ad gives the information that "Coke means only Coca-Cola...and Coca-Cola means only Coke...each is a Registered Trade-Mark which identifies only the product of the Coca-Cola Company"
Full color 9 1/2" x 13" ad for the "Refreshing New Feeling" that you get with Coke. There is a picture of two ladies who have embarked on a day of shopping. They have stopped off somewhere for a bite to eat and are sitting at a circular white table with petitte sandwiches and glasses of ice-cold Coke. Their packages have been dropped to the floor and their faces are filled with smiles as they concentrate on their glasses of Coke leaving the sandwiches for later. The text mentions "what a special zing...you get from Coke" and claims that a stop WITH Coke will "send you back shopping with zest". Full color 9 1/2" x 12" ad for the wonderful taste of Coke. The ad has a picture of a couple that are riding up to the top of the ski slope in a chair lift that has them enclosed in a red pod. The man is taking a drink from his bottle of Coke and the word "Zing!" is floating into the mountain air. 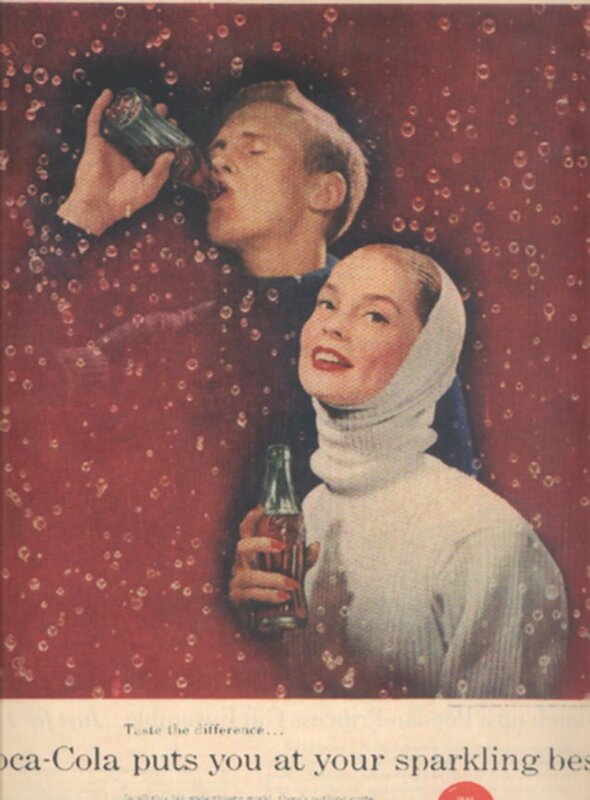 The ad headline assures you that "Only Coke gives you that Refreshing New Feeling". This ad is larger than my scanner bed so the outer edges of the ad will not be visible in the scanned view. Full color 9 1/2" x 12 1/2" ad with several different small photos of Coke being cooled and being enjoyed. There are seven different sections of text that say "Coke means only Coca-Cola...and Coca-Cola means only Coke...each is a registered trade-mark which identifies only the product of The Coca-Cola Company". This ad is larger than my scanner bed so the outer edges of the ad will not be visible in the scanned view. Full color 9 1/2" x 13 1/2" ad that highlights the Pick-Me-Up that a Coca-Cola will give you and your friends. Pictured are three ladies who are in the middle of a busy day of Christmas shopping and have stopped at a Soda Fountain to have some burgers and a Coke. They sit talking as they slip their shoes off and the ad reminds us that "Only Coke gives you that Refreshing New Feeling...that special zing...right down to your toes". Full color 9" x 12" ad has a photo of a lady in a red dress sitting at a table with a man who seems to be wearing a clown suit. The are both drinking Coke but their eyes are only on each other. This ad is larger than my scanner bed so the outer edges of the ad will not be visible in the scanned view. Full color 10" x 13" ad that shows you what you will be offered if you are popular. The ad has a picture of the beach where an attractive lifeguard in a red bathing suit is sitting on her white tower and smiling as what seems like every young man at the beach has come and is raising an ice-cold bottle of Coke toward her in an effort to win her favor. The ad text asks you to "Salute fun in the sun with an ice cold Coca-Cola". This ad is larger than my scanner bed so the outer edges of the ad will not be visible in the scanned view. Full color 9 1/2" x 13" ad that tells us that Big Jobs call for a Coke. There is a picture of a couple who are working on bathing their Sheepdog. The man is squatting down and working on the patient dog who is sitting on a galvanized tub while the woman is on the other side of the tub laughing as she enjoys her Coke. The man's Coke is sitting next to him waiting for the completion of his job so that he can enjoy the "lively lift in the spirited, never-too-sweet taste of Coke". Full color 9" x 12 1/2" ad with another way to enjoy Coke. The ad has a picture that shows an opened bottle of Coca-Cola waiting to be poured into a glass that is filled with some unusual ice cubes. Behind these is a plastic ice cube tray that is filled with ice cubes that had different berries, cherries, mint and lime dropped into them before it was frozen. The ad calls it a "Refreshing New Feeling". This ad is larger than my scanner bed so the outer edges of the ad will not be visible in the scanned view. Full color 10" x 12" ad showing an attractive lady at a sporting event having bottles of Coke passed to by all the admiring men around her. This ad is larger than my scanner bed so the outer edges of the ad will not be visible in the scanned view. Full color 9 1/2" x 12 1/2" ad that reminds you that "things go better with Coke". There is a picture of a very attractive lady sitting at a soda fountain with a bacon, lettuce and tomato sandwich in front of her. Her attention is drawn away from the magazine she is reading, one that has a full page picture of her in it, by a male hand that is reaching into the picture with a filled glass of ice-cold Coke. She has somewhat of a bemused smile on her face as she seems to be staring at the man who is offering her the liquid, sizing him up. The text, as always, reminds us that "People go better rereshed. The never-too-sweet taste of Coca-Cola gives a special zing...refreshes best!". Full color 9 1/2" x 13" ad with a picture that gives you an idea just what the taste of Coke is really like. The picture shows a glass filled with Coke sitting amongst ice-covered branches on a cool, crisp morning. The ad says that "You'll go better refreshed. The never-too-sweet taste of Coca-Cola gives that special zing...refreshes best". This ad is larger than my scanner bed so the outer edges of the ad will not be visible in the scanned view. Full color 9 1/2" x 12" ad has a photo taken from high up an Autumn tree. The photo shows a young couple who were busily working on gathering leaves from their yard before they stopped to enjoy bottles of Coke. This ad is larger than my scanner bed so the outer edges of the ad will not be visible in the scanned view. Full color 10" x 13 1/2" ad with a giant photo of a glass marked "Drink Coca-Cola" on it sitting behind a big burger with lettuce and a tomato on it as it sits under a sesame-seed bun. The large white headline tells you that "For the taste you never get tired of" before finishing with the statement "Coca=Cola is always refreshing...that's why things go better with Coke after Coke". Full color 10" x 13 1/2" ad with a Surfing theme. There is a close-up picture of a bottle of Coca-Cola with the image of a man surfing the ocean visible in the bottle. The headline says "Wave after Wave, Drink after Drink" and the text talks about riding the big one all the way in then rewarding youself with a Coke. 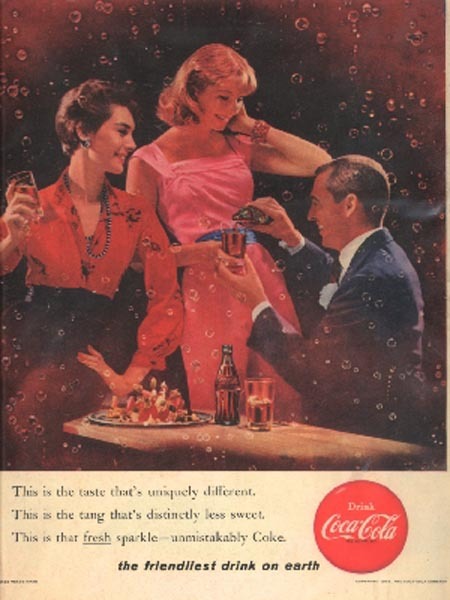 The ad is careful to describe the things about Coke that have always been enjoyed including the fact that you can get it cold. Full color 10" x 12 1/2" ad with a Fishing Theme. 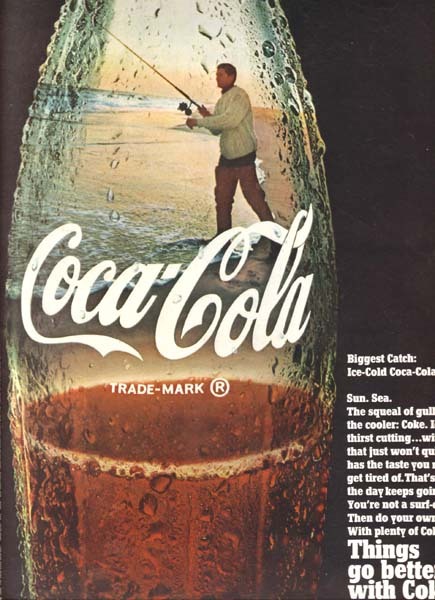 The ad features a close-up of a half filled bottle where, when looking inside, you can see a man surf fishing. This ad is larger than my scanner bed so the outer edges of the ad will not be visible in the scanned view. 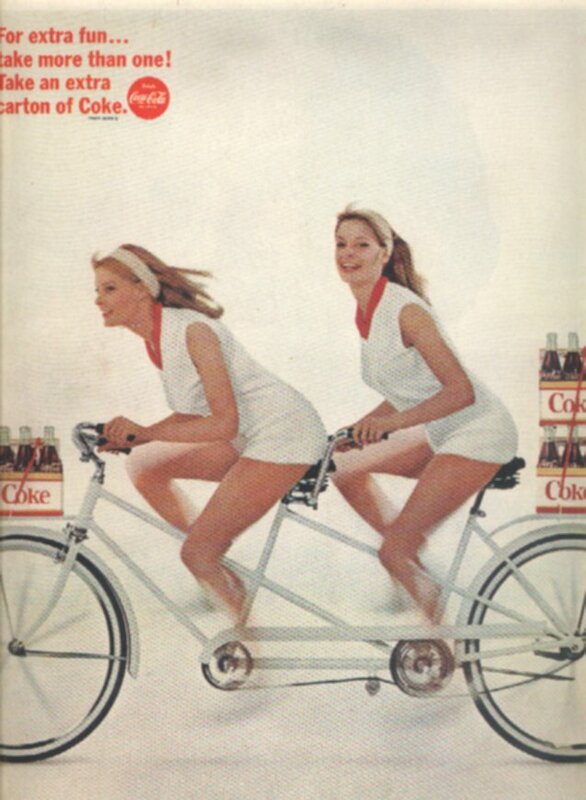 Full color 9 1/2" x 13 1/2" ad with another activity where Things Go Better With Coke. There is a large bottle of Coca-Cola, partially drank, and a view of a couple at the beach running with a kite that is just getting up in the air. The headline asks you to "Tell your Thirst to go Fly a Kite". It also tells you that Crackling Cold Coca-Cola is the best way to beat the heat on 90 degree day but it doesn't have to be hot to enjoy it. Full color 9 1/2" x 13 1/2" ad that brings attention to some of the amazing sensations in life, ones that are in addition to drinking a Coke. There is a picture of a giant bottle of Coca-Cola with an inset image of a roller coaster speeding down the track as the many passengers shriek and yell. The text claims there is "No sensation like it!" before clarifying itself by adding "The roller coaster is fun, too". The text goes on by having you picture yourself being hot and draggy, "limp as week-old lettuce", before reminding you of the effect that having a "brisk and bright and frosty cold" Coke will have on your day. Full color 9 1/2" x 13 1/2" ad with a Cook-out on the Beach theme. There is a large bottle of Coca-Cola shown in the ad that has the top of the bottle empty. In this clear area we can see several people cooking over a campfire at the beach and drinking Cokes as their delicacy simmers in a pan. 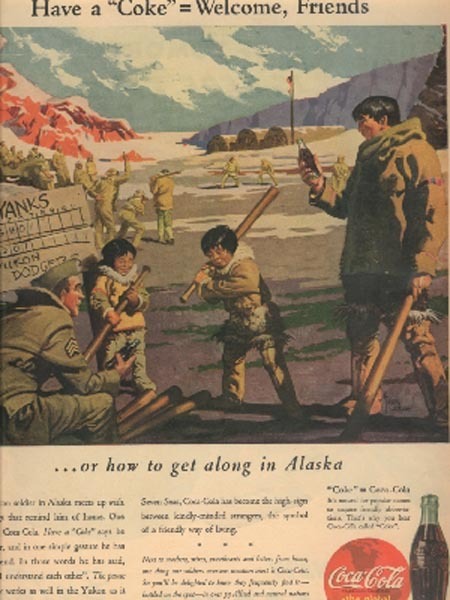 The text claims that "The Great Outdoor Life goes even greater with Ice-Cold Coca-Cola". They want us to believe that "Actually, food isn't any better with Coke. It just tastes that way.". They say that "cans" will make your outdoor experience even better. Full color 7 1/4" x 10 1/2" ad that offers a 16" x 27" pop art poster of singer Aretha Franklin. The poster is pictured in the ad, showing the Queen of Rock singing, and there is a coupon that when filled out and mailed in with 50 cents would have the poster on its way to your bedroom wall. Full color 7 3/4" x 10 3/4" ad for their Drive Like a Pro Contest. There is a picture of a pit crew servicing a stock car on a track and the headline asks you to "Tell us what you think is happening in this pit and you may win one of six 1969 Buick GS 400 Sport Coupes". The Coca-Cola company wants people to drive like pros and they feel that this car will make it more possible. The ad also mentions a Pit-Stop Poster Offer where four different posters were available for $5.00. Full color 7 3/4" x 10 3/4" ad that reminds everyone that Christmas is a very important time to offer Coke. The ad has a bottle of Coca-Cola with the cap already off, sitting in a bed of crushed ice and the headline calls it "Santa's little helper". It reminds you that if a Coke tastes good to you while trimming the tree and wrapping presents, just think how good it will taste to the big guy as he goes from chimney to chimney. Full color 9 1/2" x 14" ad that makes another medicinal claim for the value of Coke. There is a picture of a chilled bottle of Coca-Cola sitting in the middle of a field with wildflowers under a headline claiming that it "Relieves spring fever". The text talks about not feeling guilty about having a Coke but warns that you may not feel like going to work until you have it finished. Full color 9 1/2" x 13 1/2" ad for the fact that Coke is the Real Thing. There is a picture of two bottles of Coca-Cola sitting and chilling in a bed of ice. There is an inset picture that shows a couple astride a motorcycle who have stopped in the road and are talking to another couple who are sitting in an antique car. The headline there states that "Real life calls for real taste. For the taste of your life - it's Coca-Cola. Here and now." Full color 9 1/2" x 13 1/2" ad that wants you to know for sure that "It's the real thing. Coke". The ad shows a glass filled to the top with ice and Coke behind a bottle opener and the cap from the bottle. The text works on convincing you that "Real life calls for real taste. For the taste of your life - Coca-Cola". Full color 9 1/2" x 13" ad has a tie-in with McDonald's Restaurant. The ad has a photo of a well-marked Coca-Cola dispenser pouring liquid refreshment into a McDonald's cup. The ad headline reminds the public that "At McDonald's we serve you the real thing." This ad is larger than my scanner bed so the outer edges of the ad will not be visible in the scanned view.